We can't predict a volcanic eruption more than a few days or months in advance. 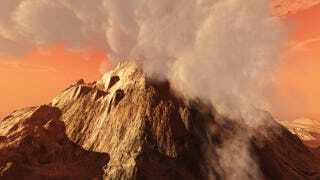 But one of the most devastating eruptions in human history could give us a huge boost in predicting the next massive volcano. About 3,500 years ago, the Santorini caldera erupted, wreaking havoc throughout the Mediterranean and all but wiping out the Minoan civilization on Crete, which in turn might well have served as the inspirations for legends about the destruction of Atlantis. After lying dormant for 18,000 years, the volcano arguably rewrote the future course of Western civilization in an instant. But could anyone have seen it coming? "When volcanoes awaken and when the magma starts to ascend to the surface, cracking rock as it does, it sends out signals. You get seismic signals, you get deformation of the surface, increasing gas emission at the surface - and this can be detected. "The question we're addressing here is what's going on at depth prior to these big eruptions. The classical view was that during long repose periods over thousands of years, magma slowly accumulates a few kilometres below the volcano and finally it blows. What we're finding is that there's an acceleration phase of magma build-up on a time scale of a few decades, and that's surprisingly short given the thousands of years of repose that have preceded that eruption." The researchers argue that we need to set up monitoring stations near all the caldera volcanoes to be on the lookout for this distinctive magma buildup. While our current early warning systems give us enough time to evacuate the immediate area, a few days or months isn't really enough time to make any longer term plans or work to minimize environmental and economic damage. That's particularly important when we're talking about caldera volcanoes like Santorini or the Yellowstone supervolcano, which are capable of unleashing destructive forces on a whole other order of magnitude than what we're used to. With this amount of early warning time, we might even be able to develop the ability to prevent these eruptions before they even occur, although that's beyond the capabilities of our current technology. Nature via BBC News. Image by Dariush M., via Shutterstock.